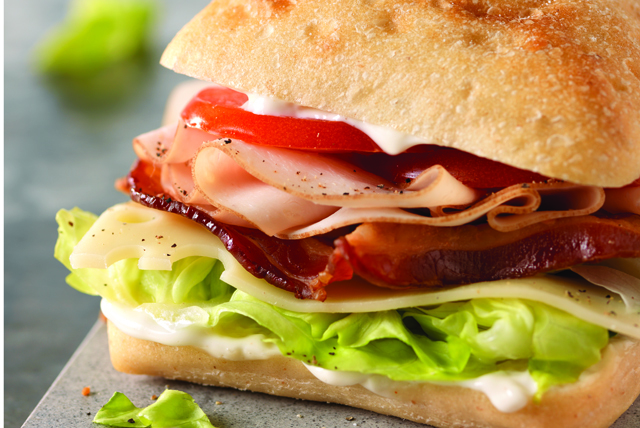 This Healthy Living club sandwich is made with tender chicken beast, crisp bacon and (you guessed it) Swiss cheese. Spread dressing onto bottom half of roll. Prepare using KRAFT Mayo Horseradish-Dijon Flavored Reduced Fat Mayonnaise and/or OSCAR MAYER Natural Applewood Smoked Turkey Breast. Save time by cooking bacon in the microwave as directed on package. Prepare using a KRAFT Slim Cut Sharp Cheddar Cheese Slice.